Matt Yglesias of Vox and The Real Deal’s Business Insider both write that the next big housing crisis is here. What is it? 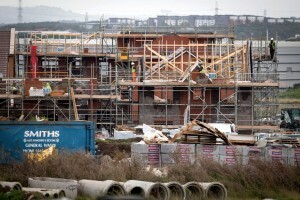 A chronic undersupply of housing for a growing country, or put another way increasing demand chasing too little supply. The good news is that solving this problem would create several good outcomes that include not only creating much-needed housing, but also providing good-paying construction jobs that can’t be outsourced to China. Apartment construction has risen dramatically, but these new units serve mostly high income earners. Additional factors are at play – housing types that are currently being built; an uncertain outlook regarding employment and weak wage growth; the creditworthiness of borrowers; and debt (be it student loans or foreclosures) – that make this more than just a case of supply and demand. It seems that the housing we need – more affordable starter homes, more affordable multifamily units near transit and jobs, perhaps even more mobile home communities – is constrained by several factors including restrictive zoning, opposition to increased density and an unwillingness to approve more multifamily rental development in large areas of the country. While more housing will ease the shortfall, there is no guarantee that additional units will make housing more affordable unless localities adopt policies that require affordable units be included in new development or preserved as affordable in redeveloped areas. Since most of our region’s affordable housing will be built by for-profit developers, it’s important to bring all parties to the table to determine the percentage of affordable units to be included in a development. That balance should meet the policy goals of the locality to include affordable units without causing an unfair burden on the developer.